Pull open the distinctive wood cabinet and discover 10 ready-to-play classic family games! 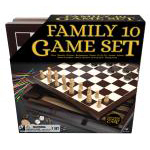 From board games to dice games to Pick Up Sticks, there’s a game for everyone. Traditional favorites including Chess, Checkers, Backgammon, Chinese Checkers, Mancala, Insanity, Mill, Tic-Tac-Toe, Pick Up Sticks, Roll Em, and Mind Magic are all at your fingertips. Made from premium quality materials, this wood cabinet includes 5 dual-sided game boards and everything you’ll need to play 10 different games. It’s a game library that offers your family and friends hours of fun.